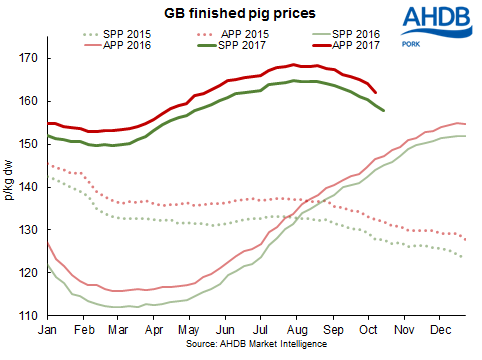 The pig price continues to decline, with the E-spec SPP down another 1p last week to stand at 157.89p/kg. After eight consecutive weeks of decline the current quote, while still historically healthy, is now only 12.81p above year earlier levels. Speaking at the NPA's South Central regional event at Newbury on Wednesday, AHDB's Bethan Wilkins outlined the factors contributing to the falling prices. The include rising supplies on the domestic market, as carcase weights and pig numbers increase, against static demand not helped by recent plant breakdowns. last weeks average carcase weights of 85.26kg was the heaviest recorded since the series began in April 2014 and, 830g, the largest weekly gain since the beginning of January this year. Meanwhile, rising EU supplies and similarly static demand are pushing EU prices down, increasing import competition and putting pressure on prices. Demand from China has also weakened on the back of rising domestic demand possibly high consumer prices, with EU export volumes down this year, although UK exports to China continue to stand up well, compared to last year. With EU production expected to continue to rise, the outlook is for this trend to continue for some time. Among the big global factors, to keep an eye is the expansion of the US herd, particularly if the North American Free Trade Agreement (NAFTA) breaks down and the US targets the Asian market, where it could pose serious competition for EU exports. Meanwhile, straw prices continue to rise on the back of short supplies hit by the wet autumn weather. Typically straw prices are £15-£20/t higher than a year ago, and in some cases, more. Prices rose across the regions again, notably in the South region where barley (£65/tonne) and wheat (£58/t) straw were both up £7/t and South Wales and South East Scotland, where prices were up £5/t on the week. Barley straw in the South West now averages £80/t and wheat straw £75/t, more than double the prices of a year ago.